Oscar winning director Kathryn Bigelow and writer Mark Boal both of “Hurt Locker” fame, initially set out to make a film with no ending, the hunt for Osama Bin Laden or in CIA speak “UBL”. As world events moved on, the film found itself a conclusion that no screenwriter would have dared to write. A tense climactic night time attack on a compound in Pakistan by stealth helicopters laden with US Navy seals. There will be few who will enter the cinema not knowing how this ends, much like “Titanic”, here is a plot spoiler, the boat sinks. Whilst reportedly receiving no direct military help, this depiction is as close as you will get to witnessing the background story and final hours in the hunt and killing of US “Enemy number #1”. The story follows the quest, crusade or bordering on obsession of “Maya” (Jennifer Chastain) a CIA operative employed to hunt down Al Qaida operatives and especially UBL. She joins a team doing their best in piecing together eye witness accounts and confessions into a meaningful lead to follow. Whilst the group are motivated by 9/11, progress is slow with even with the liberal use of “extreme measures”, all combining to produce no meaningful result. The start of the film centres on the use of “enhanced interrogation” (waterboarding, sleep deprivation beatings and ritual humiliation) to generate the information required to feed the massive manhunt, complete with a bounty of $25m. There is no space here to discuss the merits or validity of such actions and interestingly the director makes no attempt to justify, explain or put into context any of the actions undertaken. The story does a good job of explaining the laborious yet dangerous work being undertaken and the erosion of humanity on every side of the equation. The story is also framed by the various atrocities that occurred during the time period, Khobar, Times Square foiled plot, London bus bombing and the Marriott hotel destruction in Islamabad. 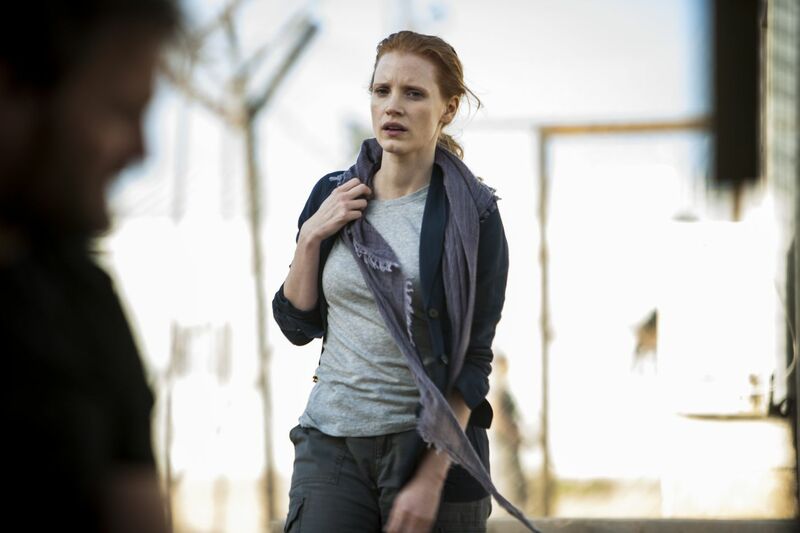 Chastain is superb in showing the cost on herself and ultimately the value of the work she has undertaken. Years of work essentially to kill someone, dangerous or not, is perhaps not what you want to be ultimately remembered for. All the actors are excellent, with Jason Clarke as “Dan”, Joel Edgerton, Jennfer Ehle and Mark Strong other notable stand-outs. Watch also for the late James Gandolfini in a small but important role, providing another example of why he will be missed from our screen. Effectively this is the story of the hunt and killing of Osama Bin Laden. The movie is superbly shot with wholly believable characters and behind the scenes machinations. The end sequence is thrilling and masterfully shot in almost documentary style, partly in night vision, on a replica compound purpose built for the film, as are the replica stealth helicopters. From a film point of view, whilst episodic in nature, this realistically is the only way some ten years can be collapsed into a reasonable running time, although this remains a long film. However, quite what you feel whilst watching or reflecting afterwards is something for the viewer to decide and will very depend on your age, life experience and geo-political leanings. The film makes no attempt to explain and flag waving is all but non existent. The changing political scene is shown obliquely, with more recent political voices attempting to regain the purported US moral high ground. As the character of Dan says, “you don’t want to be the last one caught holding the dog collar”. A very clinical, dispassionate film, which demands that you make up your own mind as to who are the bad guys, is the world a safer place, do the ends justify the means, all big questions. Whilst perhaps criticised for taking this more even handed approach, showing the story with the information to hand, then allowing people to make up their own mind, is a brave directing approach to take. One caveat, the use of real 9/11 emergency call voices at the very start, is perhaps in questionable taste, especially for those directly/indirectly impacted. Ignoring geo-politics and treating this as entertainment, this is a superbly directed and acted slow burn action thriller, with a tense played for real climactic raid by US Navy Seals. As close to the action as you would ever want to be but if you are looking for answers, this is not the place to look, ultimately posing more questions as any thoughtful director should, given the subject matter.